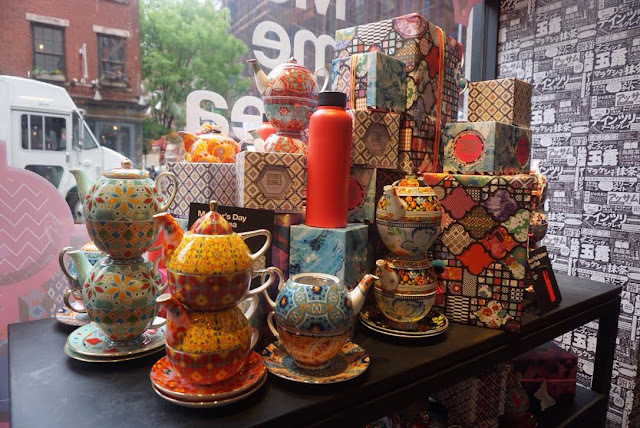 Over the last year or so I'd walk down Prince street in SoHo and notice a jewel box of a store selling tea and teaware. The displays were always colorful and inviting. Every time I passed by I wanted to pop in, but I was always rushing somewhere. 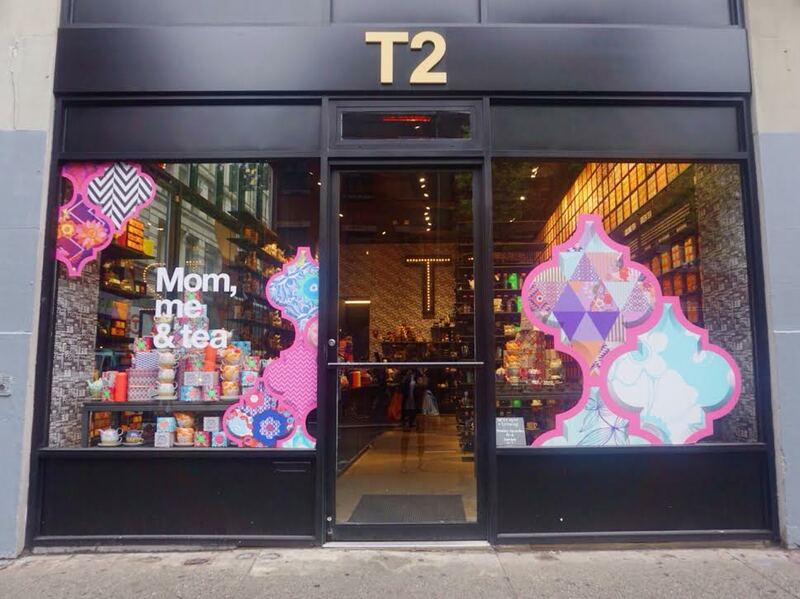 T2 is a successful global chain that started off small and grew impressively. They were recently purchased by Unilever and will undoubtedly be expanding even further. I first tried T2 a few years ago when my husband brought back a couple of teas from a business trip to Australia. This was back when they were an Australian chain. I remember we had a breakfast blend that was quite strong and flavorful. 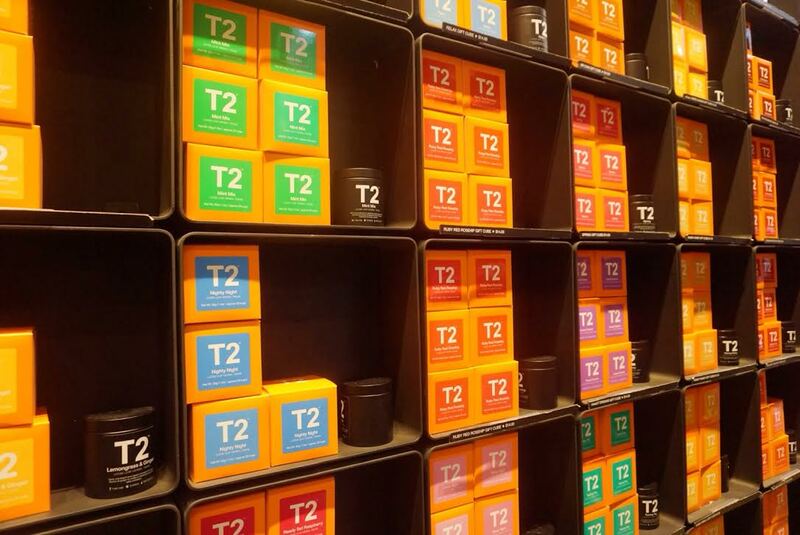 T2 is known for inventive blends but they also have a huge inventory of teas and teaware. I was recently invited for a tasting at the SoHo store and was happy to finally find a time for a visit. The day I visited was chilly and dreary, the sky was thick and grey. One of those days when NYC broods and sulks. It was quite a contrast to walk inside a T2. The store is chock full of colorful, quirky tea displays with interesting items to see at every turn. I had fun looking at teapots and teacups of every size and shape. The vibrant hues reminded me of another popular tea chain, but the design and customer service is a bit different. If you are curious about a tea you haven't tried, you can taste before you buy. It's one thing to observe and smell a tea, but without tasting it you are basically buying it blindly. I always appreciate the stores that brew up a taste to help you decide what to purchase. I like that the tea is prepared right in front of you in a translucent vessel so you can watch the leaves dance as they steep. I tried the Yunnan golden tips, which is a malty and bright tea with a sweet raisin note. Was it better than Yunnan black teas I've had from my favorite vendors? Not exactly, but it is still a very pleasing cup. I took home their Morning Red blend, which is a zippy blend of keemun and Assam. This tea is smooth with a hint of smoke and honey. I'm very picky with my morning tea, and this one wasn't as bright and bold as I'd like, but for me it's a great mid-morning or afternoon tea pick-me-up. 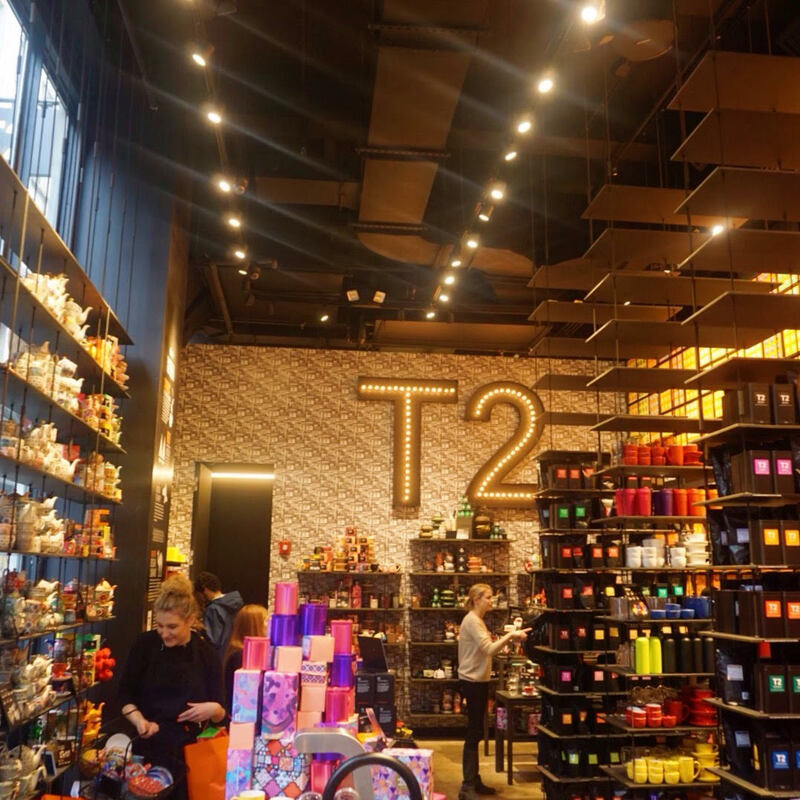 The T2 store is great for gifts, as the selection is vast and much of the tea comes festive in brightly patterned boxes. The teaware is all designed for T2, and they often add new designs. If you're purchasing a gift, they'll wrap everything up in cheerful paper. The array of colors and products can be a bit overwhelming, but everything is well organized and the staff is quite knowledgeable. There are some nice Mother's Day gift options I was tempted to pick up for my mom, since she's a fan of tea blends. The set called Love, Friendship & Tea comes with a fun cup and saucer, French Earl Grey, and a strainer (which is really too small to actually use). I think my mom would enjoy the experience of opening this pretty package, and I could see her using the tea with the cup and saucer daily. There is also a gift pack called Breakfast In Bed that has two breakfast teas in a trippy box reminiscent of a lava lamp. Having tea in bed sounds like an ideal way to start Mother's Day (hint, hint, Mr. Tea Happiness). As I mentioned the tea selection is immense, and I was actually interested in trying some of the herbals. I'm not usually an herbal tisane gal, but there are a few with ingredients native to Australia that looked very interesting. I also took home a tisane comprised only of jasmine flowers, which I found intriguing. I've never seen this as a tisane before. I noticed other pure flowers as well, all of which would be fun to use for blending. I was tempted by a 17-ounce stainless steel flask that looks quite rugged and perfect for my klutzy ways. It has a removable strainer and can be used for both hot and cold teas. 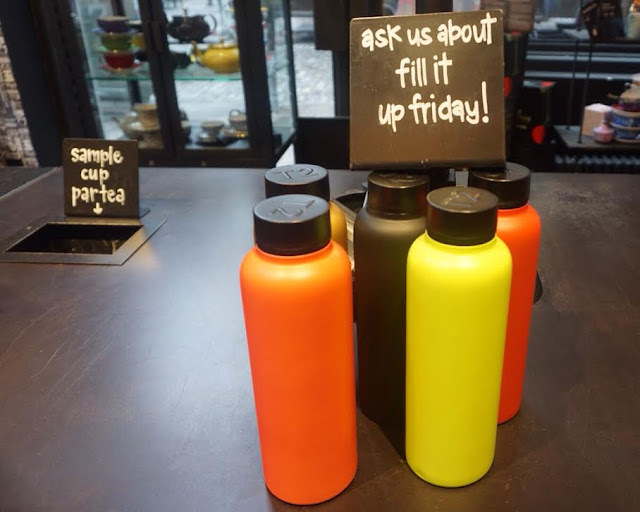 You can bring the flask into the store every Friday and they'll fill it up with a tea for free. I certainly wouldn't say no to that. T2 is a few blocks away from Harney & Sons, and not far from a few places where you can sit down and have afternoon tea. I'm glad to see that there is another tea buying option in the area, especially since Palais des Thés has sadly closed its doors. T2 may be owned by a tea giant, but I really enjoyed my experience in this vibrant store. I have quite a few more teas to taste and review from T2, so stay tuned. Some may also be making an appearance at the Office Tea Club. Have you tried anything from T2? I'd love to know your feedback on the teas, and the store. Also, let me know if you've noticed any change in the tea quality after the Unilever ownership. I'd be curious to hear your thoughts since I don't have enough experience with them to compare. Thank you to Jennine and T2 for showing me around the store and for all of the products. ooh great to know Nicole! I may have to pick one up, I can always use a durable flask. I'm impressed that it can keep the tea so hot.